Reading, Pa. – Can feeding fruit flies soy products eventually lead to a treatment for an aggressive form of breast cancer? That’s the question rising Albright College senior Theresa Shafto ’18 is spending her summer tackling. 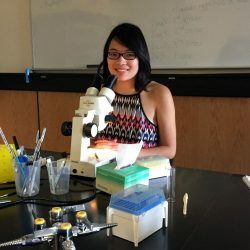 In a laboratory in Albright’s Science Center, Shafto, a biology major from Neptune, N.J., is raising fruit flies – which are genetically similar to humans – and feeding them a steady diet of isoflavones, a compound common in soy products that mimics estrogen-like effects in the body, to understand what impact it may have in the battle against triple-negative breast cancer. A subtype of the disease, triple-negative breast cancer lacks the three most common therapeutic targets, meaning common forms of breast cancer treatment, including hormonal therapies, are ineffective. While triple-negative breast cancer may respond to chemotherapy and radiation, researchers have been looking for new, targeted treatments. Shafto is among them. Working with assistant professor of biology Erin Ventresca, Ph.D., Shafto is trying to determine if the isoflavones she’s feeding the fruit flies will bind to the estrogen related receptor, or ERR, a hormone receptor that is present in people with triple-negative breast cancer. This hypothetical binding can potentially open the door to a new therapy for the cancer. Shafto’s project is to determine, using fruit flies that express fluorescence only when the isoflavones bind to the ERR, if this binding occurs, and to determine where and when in the fruit fly larva. “Theresa has been working very hard to figure out how to quantify fluorescence so we can compare different feeding conditions,” said Ventresca. Fruit flies, or Drosophila melanogaster, are widely used in biological research as they have a fast maturity rate, their genome is fully sequenced, and a significant number of their genes are similar to human ones. “This research has been an engaging experience for me as I’ve learned more about triple-negative breast cancer through the Drosophila melanogaster,” said Shafto. Shafto’s work is part of the Albright Creative Research Experience (ACRE), a multi-disciplinary program that affords students the opportunity to conduct research or pursue creative endeavors during the three-week January Interim or summer break. Students work one-on-one with faculty advisors and receive stipends from the College. As part of their work, ACRE students present on their research during the summer and fall, and often go on to present their findings at regional or national conferences or use it as a springboard for further study. Shafto is also a recipient of a Hearst Foundation undergraduate research award for this project. After graduation, she hopes to pursue a career in laboratory research in the health field.